We don’t just motivate. We combine the power of motivation with the delivery of great results – across all sectors and industries. Fearless, charismatic, funny and hugely inspirational Mike Stevenson is a must see speaker who puts the exhilaration into what’s ahead and creates a surge of energy whenever he takes to the stage. ‘This man changes lives’ and ‘Scotland’s Champion of Ambition’ – praise for Mike’s speeches come from as far afield as Australia and Brazil. He leaves audiences empowered, motivated and energised. 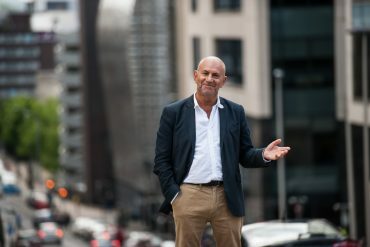 His own journey from homelessness to multi-award winning entrepreneur is a brilliant metaphor for ‘change’ as a way of life and his trailblazing ideas have guided countless businesses and public service agencies. Mike is an occasional Sunday Times columnist, a regular BBC Radio favourite and has an explosive book on his life and values on its way later this year. As a Speaker his clients include RBS, British Gas, Lloyds, Standard Life, NHS, Scottish Government and The Universities of St. Andrews, Dundee and Leeds Beckett. As Marketer he has worked with many top brand names over the past 25 years. Public Sector as Wealth Creators?